KLM sells at average 5500 tickets per day online representing about 5 Million generated by their booking engine. 27% of their users doesn’t know exactly when to travel as ticket prices differ significantly day to day and flight to flight. Even when they do know when to go (52%) research showed they are highly susceptible for a better alternative. KLM has one of the richest digital platforms in its industry. 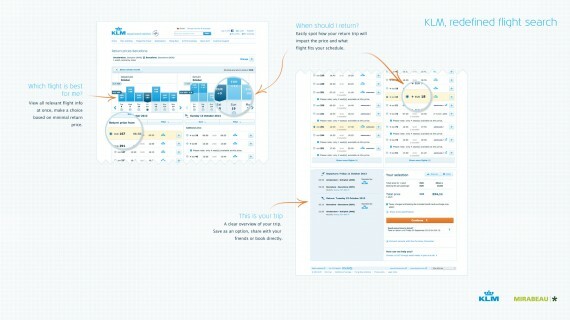 Over time KLM developed several tools focused on promotions, lowest fares and offering travel inspiration. These tools were created as stand alone elements aimed on specific user needs and having it’s own interface design characteristics. However a typical user journey is complex, and doesn’t limit itself to an interaction with one tool. Users were dealing with different flight selector tools and big differences in content, pricing and user interface. This leaded to a decrease in user satisfaction which has a direct impact on busines revenue. As KLM’s strategic digital partner Mirabeau was tasked to re-create the flight search process together with KLM. Making a uniform solution useful for all types of customers and applying a modular approach to make it fit seamlessly in all relevant places of KLM’s digital platform. Picking the right flight for your trip is not an easy task. It involves a complex series of mini decisions, balancing pro’s and cons and constantly assessing their impact. The type of trip, the flexibility of departure airport or destination, the role of budget or quality time at the destination are just a number of variables that play an important role in this process. The journey from idea to booking can start anywhere, a Google result page, a flight aggregator or a social channel. Most of the time it spans multiple devices, multiple platforms, multiple people and multiple days. Using different user scenarios based around the KLM persona’s the team covered a wide variety of use cases related to flight search and travel inspiration. By breaking down the scenarios into smaller user stories, followed by grouping these user stories into shared clusters we found strong overlap between these scenarios. This gave use important insights in the different types of user needs that had to be supported at which time and context; be it the flexible, low cost promotion seeker, the summer holiday planner or the schedule driven business traveller. Currently this tool is used as a flight search result page from the KLM homepage, on 104 destination specific inspirational landing pages, the KLM Book a trip app and the KLM Booking with friends app within Facebook. Data visualisation: direct insights into ticket price development. Easily pick the best travel day. No complex calculations: the price impact of alternatives is constantly recalculated based on the user’s actions. Modular: seamlessly embeddable within the digital domain of KLM or external platforms. Greatly improving consistency and maintainability across channels. Responsive: designed to take the multi device world into account and as a result highly usable on smartphones and tablets. 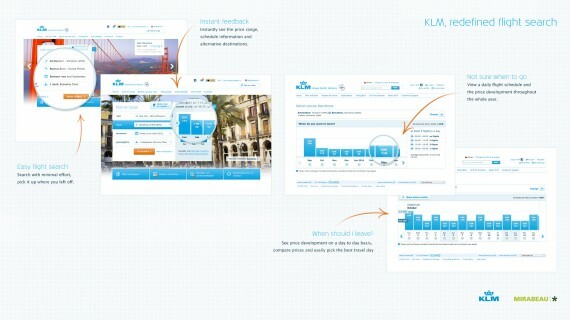 In the nearby future the implementation will expand to the KLM iPad app, promotional pages and offered as widget outside the KLM domain. Mirabeau strongly believes in approaching each strategic design project in a agile way. Close cooperation with client stakeholders and a dedicated team is key. The entire digital landscape was analyzed and important customers journey’s were modeled to get a sense of the users needs within the different phases of travel orientation. Through benchmark usability testing and conceptual prototypes a framework of pages and user flows was created. It provided the requirements for the concept to work in all identified contexts and for all personas. Multiple interface concepts were prototyped and tested with end users representing KLM personas to further discover which concepts would align with the users mental model. To make sure concepts were technically feasible all price algorithms were based on a real flight and schedule data. The prototype was connected to a live flight data feed to serve as a technical proof of concept and as input for KLM’s technical architects and information analysts. Mirabeau was closely involved during implementation in guarding the concept. Several versions of the calendar tool have been released and each of them is improved and more mature.